I love apple season. I will go to local farm markets and orchards several times, picking out different varieties. Several of my favorite varieties won’t be around until October, but there is a great selection already. I eat plenty of apples fresh, but I also cook with them. This is one of my favorite apple recipes. The tender cake and crunchy topping seem like the perfect combination. 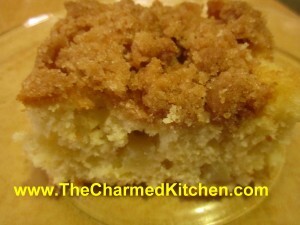 Most days I would rather have a crumb topping on a cake than frosting. This recipe hits all the right notes. Sweet with apple chunks throughout, a nice touch of cinnamon and that crunchy topping that I love. Combine dry ingredients and set aside. In mixing bowl with electric mixer, beat butter and sugar until light and fluffy. Beat in egg and milk. Add flour mixture gradually until just mixed in. Fold in apples. Grease and flour an 8 or 9-inch pan and add prepared batter. Combine topping ingredients until they resemble coarse crumbs. Sprinkle over the batter in pan and bake in a preheated 375-degree oven for 35-45 minutes. Use toothpick to test. Note: I used a 9-inch square pan and it worked fine.